This is probably the most peculiar thing I've ever had happen in my garden. Early in the spring we found a forgotten 12 pack of Miracle Grow Pods in the garage. They're basically little compostable pods that hold an ounce of soil and some seeds (peppers, cucumber, tomato, etc). We planted them in a 3'x2' tray and walked away. Ten days later we had little sprouts, but most were not in the pods. I assumed the seeds had splashed or floated out of the pods when I was watering them and migrated around the soil. 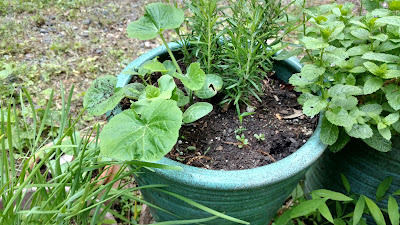 At this time I also began to fill up the rest of our pots with herbs. That's when the squash went crazy. 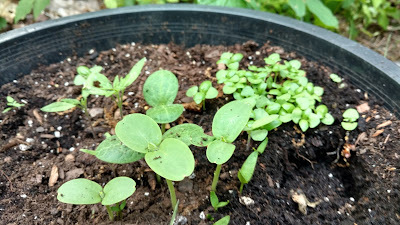 Three weeks after my initial planning there were squash sprouts coming up in all the herb pots, along with a flush of more squash sprouts in the large tray. There were so many squash in the tray we had to thin out 50% to keep them from choking out the already establish squashed, peppers, and tomatoes. Squash were in the pot with my basil seed, with the rosemary plant I bought as a starter, and in the Russian sage we bought from the University plant show. Early on, Carla thought it might have been birds somehow transplanting seeds. 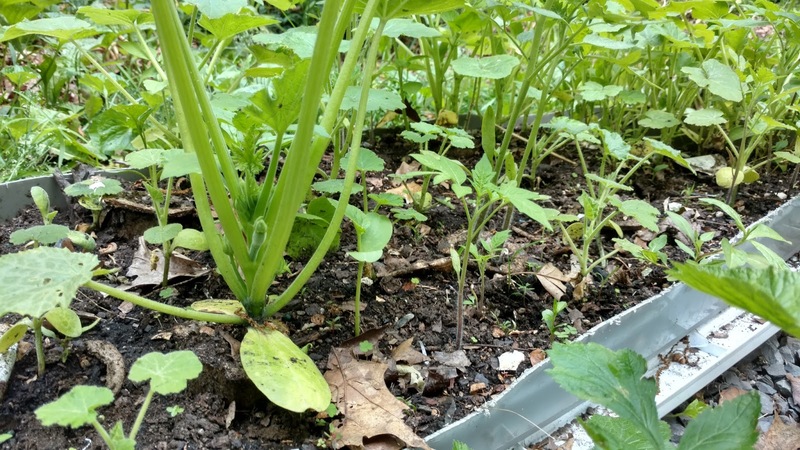 The do leave little holes where they dig in the soil for bugs and worms. Then, as the squash numbers skyrocketed, she thought it may actually be a squash-looking weed that grows among the ferns in the woods (I think it may be Canadian ginger). Finally, we admitted we had no idea what was happening, why, or when the squash would stop. Fed up with the infestation I began to pull up the squash sprouts. About 6-8 sprouts in I pulled up a sprout clinging to a weird piece of trash. It was caked in jet black soil and seemed to be plastic. That's when I got it. The sprouts were from our red worm mulching bin. Carl originally started using the red worms to compost at home, and Carla and I continued to keep the worm nest active over the years. In March I harvested the rich, cast iron black soil in the bottom tray of the worm bin to feed the early sprouting hops, rhubarb, and horseradish. In late April I mixed the second tray into a bag of soil to fill up they planter tray and herb pots. The second tray of compost must not have been fulling digested by the worms, leaving some sort of seeds from the previous winter still viable. The plastic piece must have been from some shredded newsprint I added to the worm tray. I thought I picked them all out, but remember sorting through the mulch when I first spotted them. Now that we know what the squash are from, we're curious what they might turn out to be. Candy roaster squash? Delicata? Cucumber? A weird hybrid? For all I know they might just be sterile hybrids that don't produce anything but leaves. Still, it was a fun, peculiar mystery.